Adobe Acrobat could be too advanced and costly for creating a simple PDF document. Some of the free with no watermarks and time limit alternatives are CutePDF, PDFCreator and PrimoPDF. The products offer basic PDF creation. Some might not be used for commercial purposes. The upgrade (paid) version of the products offer advanced functionality such as commenting, collaboration, etc. Introduced in Ubuntu 8.10, Linux Live on USB facilitates a way to try a Linux on a computer using a USB drive. The Live USB creation must be setup in an existing Ubuntu installation. 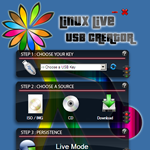 With Linux Live USB Creator, a Linux Live USB can be created using a Windows PC (Windows XP, Vista or 7). Most of the Linux distributions that contain Live system are supported (e.g. Ubuntu, Kubuntu, Xubuntu, Mint, CrunchBang, Kuki and Fedora).